Netseal is a license system used by people who have built their own programs and wants to use those programs to manage customers or regular users with licenses. When a payment has been confirmed, it will be added as a license through the netseal system. Some of the programs here on hackforums uses the netseal license system. It's a perfect tool for people who wants to sell their programs and sell package licenses, for example 1 month , 3 months etc. How do I setup Netseal? Glad you asked, now we must first have a project on either VB.NET or C# and have a netseal account. Now, remember your login credentials for netseal since your account will manage all your licenses and users. Other people who have registered their own accounts will be the users using your program after completing a transaction or payment. Now, you got the netseal license rar, extract the rar to your desktop and open the extracted folder. Now go back to your VB.net or C# project. You will notice that there is a Visual Basic Source File in the netseal license folder that you just extracted which you will add to your project. If you have a C# project, you will be using the C# source file in the same folder. VB.NET: Go to Visual Studio > Project > Add existing item > Netseal folder > Double click on License.vb > Done. C#: Go to Visual Studio > Project > Add existing item > Netseal folder > Double click on License.cs > Done. Once you have added the license source file to your project, open the license panel application in the netseal folder (License panel.exe). Login with your registered account and wait for it to login. Once you are logged in, you will notice a window in the middle which is going to be where your programs will be listed along with total users and how many who's online. There will also be a program ID which is the one we'll need for the next step. To begin with, click on "Create New Program" which is a button just under the list in the middle. Write your program name (can be anything) and click "Create". Now you have successfully created your license system for your specific program which will be seen on the list once you have added it. Once you have added your license system for your program, double click on the program like this. You can also select the program and click "Manage Selected Program" if you want to be directed to the license system configuration for your program. Now we will get to the tricky part. As you can see, whenever we create a program, we will recieve a random program ID. So in this case, you will be using the one generated for your program. When you have the program ID and your program setup, we will proceed to the next step which is adding the code to your project. You will notice that you have different files on your C#/VB.NET project on the right side of Visual Studio. Now, you have to double click on your Form1.vb (Form1.cs in C#) to show the code of your application. Now you have add to the following code anywhere in your code. 'NOTE: Replace 00000000 with your product id. //NOTE: Replace 00000000 with your product id. Looks like you're almost done. Now we are going to test and see if the application is synchronizing the netseal identification by debugging the application. But before we do that, we are going to create a license code. 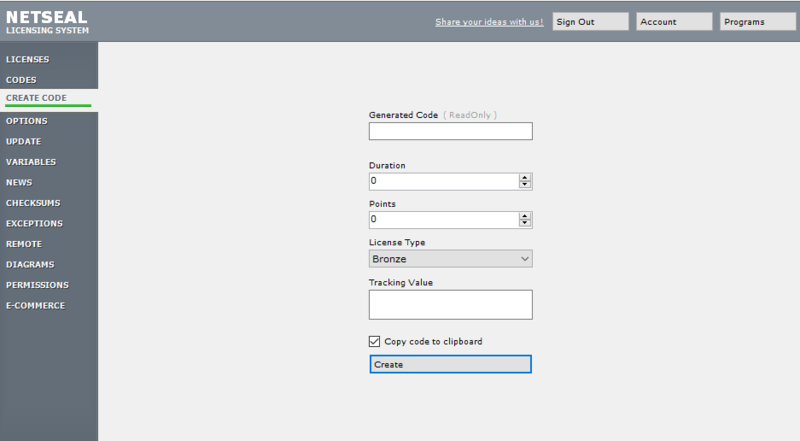 First login to your netseal account and then navigate to your license system panel (See step 3) and finally to the tab "Create Code". You will now create a code. To begin with, change the duration to 7 (value 7 = 7 days license) and the license type to Silver. You don't need to add anything to points since most people don't use points these days. In the future, having customers could be a lot of work so adding a "Tracking Value" could help finding a specific user when you need to find someone who perhaps have broken a rule or something. For now, you don't need to add a tracking value to this license code. Now when you are done, click "Create". Once you have clicked "Create", it will generate a random license code (16 digits) which you will give to your customers. This code will be used for the application of yours so that we know netseal works just fine. Now, copy the generated code and add it to a notepad and keep the notepad open. Now its time to test your application. Go to your application and click on debug (Make sure you have added the code given out in step 5) and wait for the application to load. If everything goes alright, netseal should popup telling you to login. In this case, you will login with another account (Not the one you just created). Once you have logged with another account, you can reddem the generated code provided by your own account. Example: Pretend I am a customer. I register an account with my own name which is Keiko. Your account name is "Jacob" with your programs. Basically your account "Jacob" will generate a code which will be given to me since I bought a license to one of your programs. I will then login through the application you gave me using my account Keiko and then reddem the generated code provided by you. Once I have reddemed the code, I will have access to the application I paid for, for the amount of duration you added while generating the code. If you register a new account, you will be able to give out 5 licenses using 1 program. If you want to increase your limit, you have to purchase more licenses which you could do by clicking on "Account" on the top right corner of the netseal panel application (while you're logged in) and then click "Purchase" on the one you want to buy, either more licenses or more programs to store on your account.